The study, "Asbestos in commercial Indian talc", has been carried out by by Sean Fitzgerald, Elizabeth Harty, Tushar Kant Joshi and Arthur L Frank, supported by the Scientific Analytical Institute, Greensboro, North Carolina; HHC Environmental, Lebanon, Ohio; the Ministry of Environment, Forests, and Climate Change, Government of India; and Drexel University Dornsife School of Public Health, Philadelphia, Pennsylvania. As the international effort to eliminate asbestos-related diseases continues, public health concerns surrounding the presence of asbestos in consumer talc products persists. This is not a recent development. The International Agency for Research on Cancer (IARC) recognizes this relationship and holds the position that any talc supply or products that contain asbestos should be treated as asbestos, accordingly a Group I carcinogen. In fact, the IARC Working Group decided to expand the name of the Group I carcinogen from "talc containing asbestiform fibers" to "talc containing asbestos or other asbestiform fibers," which "should be understood to mean any mineral, including talc," when it grows in the asbestiform habit. IARC has established a causal association between all forms of asbestos exposure and cancer of the larynx, lung, ovaries, peritoneal mesothelioma, and pleural mesothelioma. Nonmalignant diseases associated with asbestos include asbestosis, asbestos warts, and pleural effusion, pleural plaques, and diffuse pleural fibrosis. Other reports of disease among those exposed to asbestos include renal, oropharyngeal, and gastrointestinal cancers. The World Health Organization (WHO) reports that 125 million people are occupationally exposed to asbestos worldwide and that approximately half of all occupational cancer deaths are believed to be caused by asbestos. The WHO further states that global asbestos exposure in the home is associated with several thousand deaths annually. There are no population estimates of those exposed to asbestos contaminants in personal care products; therefore, substantial data to measure the past and future asbestos-induced burden of disease are not available. This lack of adequate data is significant when considering the traditional underreporting of diseases, such as mesothelioma. To combat the risk of sweat-induced dermatitis, major manufacturers market talcum powders (cosmetic-grade talc) to the Indian and greater Southeast Asian populations. These powders are advertised to cool against the effects of "prickly heat" and some claim to have bacteriostatic effects. These powders come in a variety of scents that would appeal to a wide range of consumers. In light of the recent evidence of the asbestos contamination (or, more accurately asbestos comineralization) and subsequent personal injury litigation related to personal hygiene and cosmetic talc products sold in the West, the objective of this study was to determine if similar product contamination is observed in cosmetic talc sold in the East, as it is known that commercial talc deposits exist in lndia. Polarized Light Microscopy (PLM) and Transmission Electron Microscopy (TEM) analyses were conducted following the analytical procedures described in the U.S. Environmental Protection Agency "Test Method EPA/600/ R-93/ 116: Method for the Determination of Asbestos in Bulk Building Materials". In February 2015, five samples of commonly available, over-the-counter brands of cosmetic talcum powders were purchased in India; some products were manufactured by multi-national corporations that originated in the United States. The mining source and location of talc used in these products are unknown. These purchases were made on the open market available to all Indian customers. The products were marketed for personal application as "beat the heat" fragranced talcum powders to be applied to the skin of the consumer. All samples were shipped to a testing laboratory for the purpose of evaluation. Abundant fibrous structures of the mineral talc were identified in the cosmetic talcum powders tested. Two basic morphologies were common of the fibrous talc: more parallel fibers or "bundle of sticks" talc structures were observed, in addition to more lath-like "ribbons"of talc, often exhibiting kinks, beds, or folds. 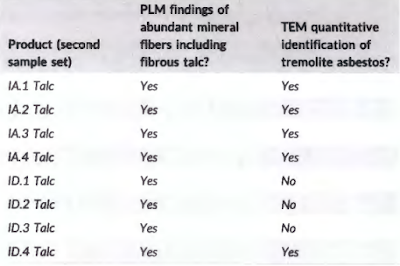 Fibrous talc was observed in all of the samples analyzed for this study, occasionally in abundance, but talc fibers or fiber structures were not quantified, as there are no published methods or counting criteria for talc fibers or complex structures. 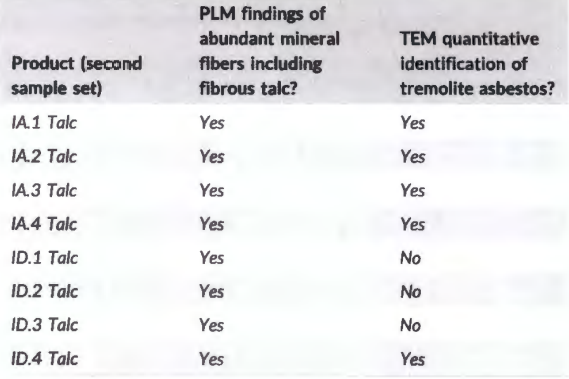 For those products that tested positive for tremolite asbestos, the total product contamination for their containers ranges between a low of 600 million asbestos structures to high of 8 billion asbestos structures. These findings imply that the asbestos-related medical and public health implications to consider will need to extend to persons of both genders and all ages among this population group. This study's confirmation of an underappreciated source of asbestos exposure, through personal care products also highlights the risk that anyone within breathing range of these aerosolizeable, contaminated, talcum products incurs. With products of this nature being readily available and appealing to both genders, it is necessary to consider what the potential health risks and burdens of disease are for millions of exposed women of childbearing age and the children for whom they provide care. IARC has confirmed the causal association of asbestos with ovarian cancer and other cancers. Shifts in perspective in epidemiologic surveillance are needed to consider how to better collect, analyze, and disseminate data that apply to these consumer product exposures. It may also help us better understand a previously underappreciated source of exposure for those with asbestos-related cancers when no history of exposure can be elicited from those individuals. A necessary measure to promote public health is to mandate quality control standards that guarantee all talc intentionally added as an ingredient to consumer products is tested before production and repeated testing is applied during production. Analyses conducted by the most rigorous and sensitive methods possible are required to assure the absence (ie, nondetectability) of asbestos in products. Further, records of where the talc was mined, and the specific records of testing must be maintained. End-users and manufacturers of those talc or talcum powder products should be held accountable for t his information and make it available to consumers. (d) introducing product liabi lity action and class action concepts as avenues for consumer compensation. While the passage of this bill is a start toward protecting public health in general, until asbestos is also viewed as a hazard in India and banned, there will still be considerable risk to health. The presence of amphibole asbestos (tremolite) among the products analyzed in this study confirms that asbestos exposure in India and potentially beyond is not limited to occupational origins. The products these asbestos using manufacturing plants produce are reaching millions within India alone.